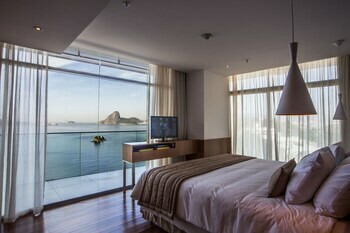 A stay at H Niteroi Hotel places you in the heart of Niteroi, within a 10-minute walk of Icarai Beach and Niterói Contemporary Art Museum. Featured amenities include a business center, complimentary newspapers in the lobby, and dry cleaning/laundry services. Planning an event in Niteroi? This hotel has facilities measuring 2153 square feet (200 square meters), including meeting rooms. Limited parking is available onsite. With a stay at Pousada Aquarela in Porto Seguro, you'll be a 1-minute walk from Monte Pascoal National Park and 6 minutes by foot from Caraiva Beach.